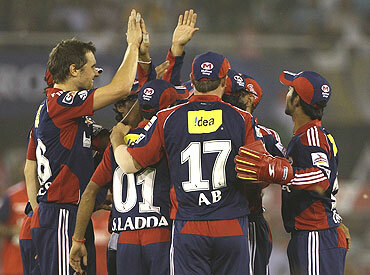 The Delhi Daredevils couldn't have asked for a more perfect start to their match against Rajasthan Royals on Monday. Royals' openers Swapnil Asnodkar and Greame Smith started their innings on a great note hitting Farveez Maharoof for two fours in the opening over. However, Asnodkar's stay at the crease was cut short, when the Goan batsman was caught by T Dilshan off the bowling of Dirk Nannes. Naman Ojha then joined Graeme Smith in the middle.Together they tried to put the innings on track. Ojha was in fine form and walloped the bowlers all around the park and was particularly merciless against Amit Mishra who he hit for back-to-back boundaries. Mishra got his revenge when he had Ojha bowled for 24. His 24 came off just 14 deliveries to keep the Royals afloat. 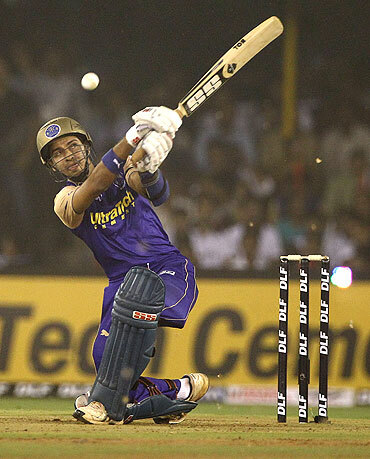 Much was expected of Yusuf Pathan, who scored a Century in the last match, to rescue the innings. However, Pathan failed to live up to his billing as he was caught out for a duck by AB de Villiers off the bowling of Maharoof. Rajasthan Royals were struggling at 46 for 3 in the sixth over. Four runs later Graeme Smith was on his way back to the pavillion. After the fall of Smith, Abhishek Jhunjhunwala and Paras Dogra took it upon themselves to give their bowlers something to defend. They didn't take much risk and nearly six overs without a boundary. They did well to pick the twos and the odd boundary. Later on, however, a mix-up ended Dogra's stay at the pitch. With this, their 60-run partnership from just over eight overs came to an end. They ensured that they took the team total to 141 for 6. 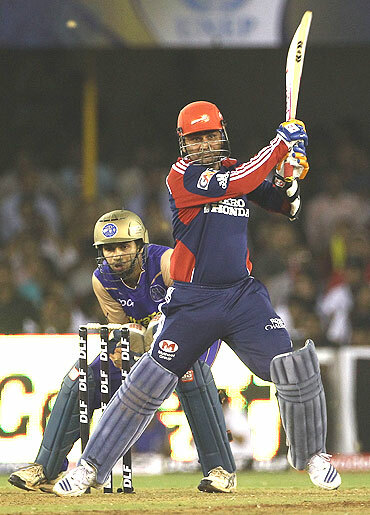 Virender Sehwag smashed 75 from 34 balls to lead Delhi Daredevils assault on hosts Rajasthan Royals. Chasing 142 to win, Sehwag and his opening partner Gautam Gambhir got off to a strong start. They blasted the bowlers to all corners of the park. Sehwag was lucky when he was dropped by Shaun Tait, but that didn't stop Sehwag from playing his natural game. Even after Gautam Gambhir and Dilshan were dismissed off conscutive deliveries, Sehawag continued to go after the bowlers. He was finally dismissed in the 10th over. Dinesh Karthik and Mithun Manhas carried on from where Sehwag left off take the Daredevils to a six-wicket victory.